Here are some quotes and commentaries on the news from known and some respected people in the business and stock market here in the Philippines. 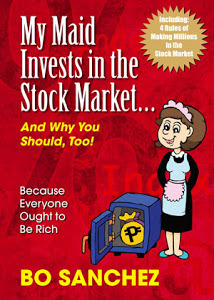 Allow me to share you thier insights about Yolanda, Pork barrel, and its connections (in some ways) on the market (The Philippine Stock Market in the Philippines), and more chop-chop plus ketchup news. For more details, please check the source below. 1. “6,400 key resistance will be retested this week... However, investors could adjust their portfolios this week as companies continue to report on the damage brought by typhoon Yolanda on their operations.... The extent of damage reported by companies might prompt investors to reposition [their stocks], such as those in the industrial sector and banks. 2. 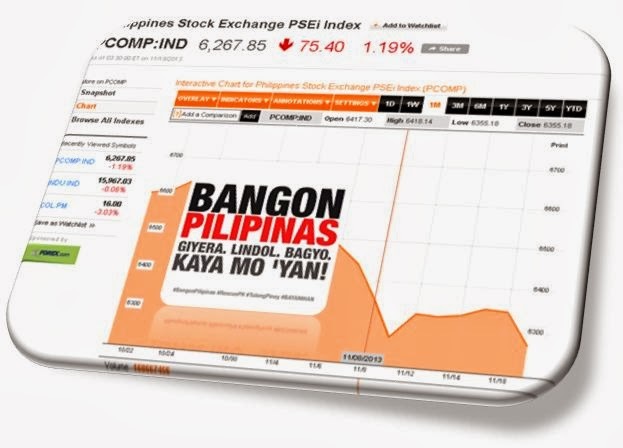 “The market sharply went down [yesterday, Nov 19] on valuation concerns as foreign funds continued to exit the Philippines,” Manny P. Cruz, market strategist at Asiasec Equities, Inc.
3. “I think investors are wary of the post-Yolanda effect on the economy,” Abbygayle M. Estrella, analyst at AB Capital Securities, Inc.
6. “Investors are concerned over the short-term impact on income, considering more than half of the company’s capacity is down and it’s uncertain when it will be back on line,” said Aaron Salvador, Manila-based analyst at Macquarie Group Ltd.
7. "We expect the transaction volume will increase towards the month end as [domestic] helpers receive their salaries," said Benjamin Panganiban, managing director of BPI Remittance Centre Ltd. in Hong Kong. 9. "Most of them are Filipinos sending money, but there are also other nationalities.... People queuing up to help with relief efforts also include Singaporeans, Americans and Europeans. On Sundays, the day off for most of the workers, the mall is thronged with Filipinos sending money home. - Charina Yap, a manager at Metro Remittance Ltd., a payment center owned by one of the Philippines' ' largest banks, Metrobank. 10. "Developments in the local political arena have also turned off investors....Another thing is there seems to be a negative backlash with regard to issues about PDAF (Priority Development Assistance Fund)....For foreign funds, this means that the government is not much in control in terms of handling funds,” - Luis A. Limlingan, managing director at Regina Capital Development Corp.